Cancer is a global health issue that impairs the life quality of patients and origins thousands of deaths annually worldwide. Six-transmembrane epithelial antigen of the prostate (STEAP1) was identified to be overexpressed in several types of cancers, namely in prostate cancer (PCa). Considering its secondary structure, associated with its location in the cell membrane, has been suggested a role in intercellular communication between tumour cells. Taking into account its high specificity and overexpression in human cancers, STEAP1 is nowadays a promising candidate to be imposed as a therapeutic target. Several strategies have been developed during the last few years for targeting STEAP1, including antibody-drug conjugates, monoclonal antibodies (mAbs), DNA vaccines and small noncoding RNAs (ncRNAs). This review presents the current knowledge about STEAP1 protein expression in human tissues, its biochemical properties and targeting strategies with the purpose to evaluate its potential as therapeutic agent for cancer. Keywords: STEAP1, Cancer, DNA vaccines, Monoclonal antibodies, Small noncoding RNA, prostate cancer. Keywords:STEAP1, Cancer, DNA vaccines, Monoclonal antibodies, Small noncoding RNA, prostate cancer. Abstract:Cancer is a global health issue that impairs the life quality of patients and origins thousands of deaths annually worldwide. Six-transmembrane epithelial antigen of the prostate (STEAP1) was identified to be overexpressed in several types of cancers, namely in prostate cancer (PCa). Considering its secondary structure, associated with its location in the cell membrane, has been suggested a role in intercellular communication between tumour cells. Taking into account its high specificity and overexpression in human cancers, STEAP1 is nowadays a promising candidate to be imposed as a therapeutic target. 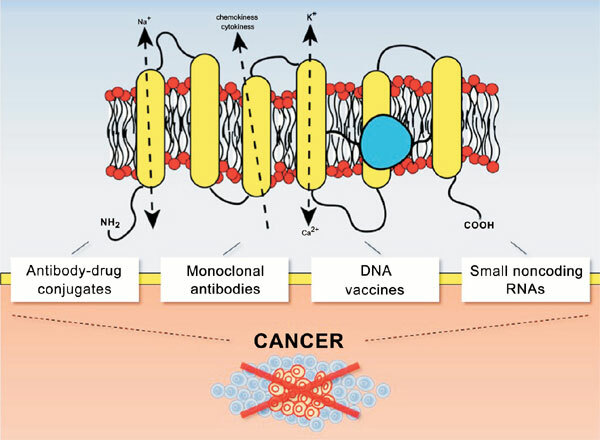 Several strategies have been developed during the last few years for targeting STEAP1, including antibody-drug conjugates, monoclonal antibodies (mAbs), DNA vaccines and small noncoding RNAs (ncRNAs). This review presents the current knowledge about STEAP1 protein expression in human tissues, its biochemical properties and targeting strategies with the purpose to evaluate its potential as therapeutic agent for cancer.